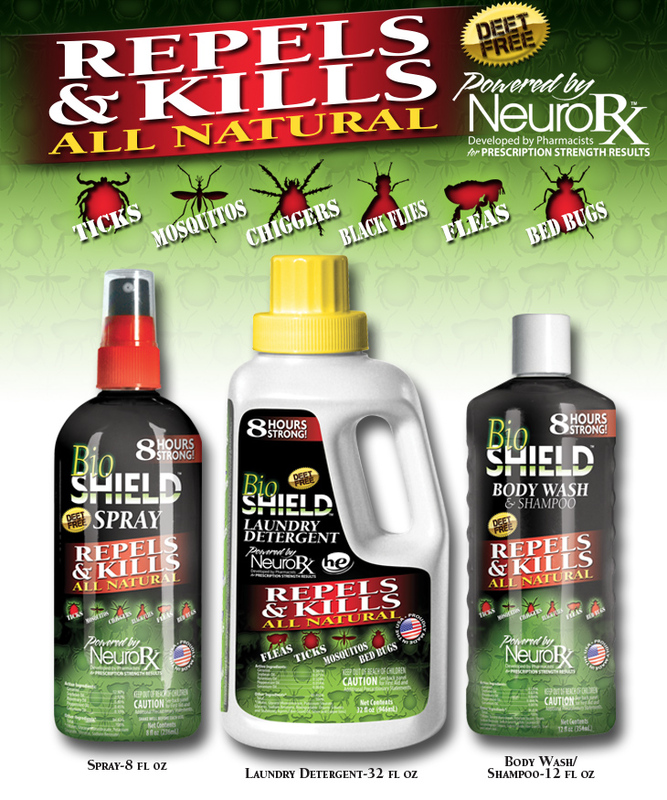 BioShield is an ALL NATURAL, “DEET FREE” insect repellent powered by the proprietary process; NeuroRx, developed by pharmacists seeking prescription strength results in an over-the -counter product at an affordable price. BioShield is a proprietary blend of all natural ingredients and therefore 100% safe to use on skin and clothing. BioShield has a pleasant citrus smell unlike most insect repellents. BioShield is safe to use on infants, children, pets, horses, cows, any mammal effected by insects. BioShield does not contain Deet. The pharmacists that developed BioShield do not recommend the use of DEET as a repellent for topical use due to concerns of toxicity. Certain naturally occurring substances have deterring effects on insects. When combined in specific concentrations utilizing our proprietary process; NeuroRx, the resultant all natural compound possesses powerful insect repellent properties and in some cases actually kills certain pests instantly. BioShield’s proprietary formula is powered by the exclusive registered process; NeuroRx. NeuroRx attacks a neurotransmitter ONLY found in insects. Neurotransmitters control heart rate and metabolism. Ticks, Mosquitos, Fleas & Bed Bugs produce a neurotransmitter called Octopamine. Humans and other mammals, birds, and fish do NOT produce Octopamine. NeuroRx blocks the Octopamine, causing a complete shutdown of insects’ central nervous system; killing them instantaneously. Whether combatting Ticks, Mosquitos, Fleas or Bed Bugs, be sure to get BioShield and apply as directed prior to going outdoors to enjoy camping, sports, fishing, hunting, jogging, etc.. BioShield leaves NO oily residue! Effective up to 8 hours! BioShield is safe to use on children and pets but is deadly to insects when used as directed! Take comfort in knowing BioShield has you and your family covered!